Sponsored by CPAW NJ and the Montclair Public Library. 50 S. Fullerton Avenue. 4 pm. CPAW NJ, a local Montclair nonprofit, along with the Montclair Public Library, brings you a free showing of The Cat Rescuers and a chance to meet the directors and actors. With over 500,000 streets cats struggling to survive in NYC, and the city unwilling to address the problem, spirited volunteers like Sassee, Claire, Stu and Tara have come to their aid. Their beat is Brooklyn, where the problem has exploded. Combing the borough's alleys, backyards and housing projects, they trap the cats, get them fixed and returned to their colonies, or adopted. THE CAT RESCUERS shows the skill, resilience and humor they bring to this challenging but rewarding work, and how their mission to reduce animal suffering, often at great sacrifice to themselves, has changed their lives. The event lasts from 4-6 pm and will be held in the MPL Auditorium. Reservations / registration required by 05/18/2019. 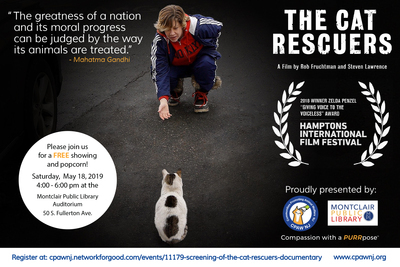 For more info: http://cpawnj.org/event/the-cat-rescuers-screening, cpawnj@gmail.com, 2019708115. Free.